If you're looking for dolls and toys from Disney Pixar's massive hit, Inside Out, you are in the right place! Inside Out is already a massive hit amongst animation fans and get story lovers, and so of course, more and more Inside Out dolls are getting released every day! Lucky us! I am soooo excited about Inside Out! I can never get enough of Disney Pixar movies, I adore them, I just want to devour them, they're just too dang good. Inside Out is certainly one of the most interesting concepts that the clever boots at Disney Pixar have come up with yet...the main characters don't even really exist - they're emotions...personified! Sounds weird, but very wonderfully weird. One of the things I love best about this movie, is the colours. Each character is so different, and has they're own set colour type - a joyful blue and yellow, a sad green and an angry red...and as fans of AnimatedMovieDolls.com know, with every beautiful character, comes even more beautiful dolls and toys to collect, and the Inside Out dolls are no exception. ...and if you're in the UK, simply visit Amazon.co.uk's Inside Out toys page here. The wait for Pixar's Inside Out has been a long one, but worth waiting every minute. Here we have the main character doll herself, Joy (voiced by Amy Poehler) and it's she a beauty? Inside Out Joy doll stands at a cool 26cm in height, and let's just take a moment to show appreciation for that fact that it TALKS! Just squeeze her lil hand and she'll recite seven phrases from the movie. But if that wasn't enough to get you super excited about this awesome doll, her face will also light up! Cute, right? Hang on thought, there's more - you might be able to see in her left hand what looks like a little bubble with a post-note inside? Well, that well that is Joy's memory ball, and there's actually space inside it, where YOU can put an image of a loved one, or your favourite celeb! WE NEED THIS TOY IN OUR LIVES NOW!! Loooooove it!! This Joy doll will look, light up and sound totally fantastic in your collection! It's always a JOY (haha) kicking off any selection of dolls from the animated movies with the Pop! versions. I adore everything about the Pop Vinyl figures - how they're made, and more important how they're styled, and their unique look. 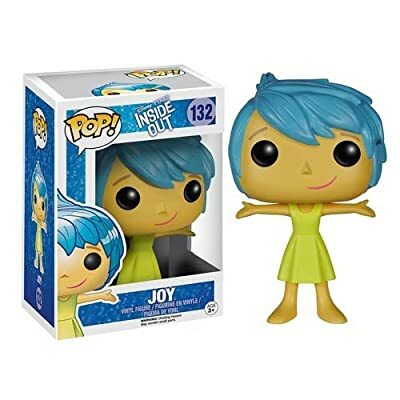 If you're going to get an Inside Out doll, but a plush one isn't for you - then it has to be a Pop Vinyl figure - and of course, it has to be the main lady emotion herself, Joy! Her simple colouring of yellowy/green with a shock of bright blue hair makes this character really stand out...and well, she's joyful...and animatedmoviedolls.com loves a positive vibe, so what's not to love about this one? This plush Joy doll, stands at around 14 inches...and guess what...this one talks too! It speaks a selection of five different phrases from Inside Out. Huggable and chattable, these toy makers really do think of everything, don't they? What I love most about the Inside Out dolls is not only the attention to the detail to, to bring to life a 3D animated character, but I love the design. She doesn't look anything like your typical Pixar or Disney princess type of style, she has funky, blue hair, bright yellow skin and a very simple dress (...sounds rather like a Simpson when it's put like that), but hey. If I were to buy my niece a doll of an animated movie, this is the sort of doll I would go for...simple and cute. Ahhh...THE most perfect thing about the characters from Disney Pixar's Inside Out, is that out of the five main emotions - there's a little bit of us in them all. When I saw the very first trailer for Inside Out, I instantly gave an "awww" when I saw Sadness. Her demeanor makes her so endearing and one of those characters you can't help but fall in love with, rather like Eeyore from Winnie the Pooh. 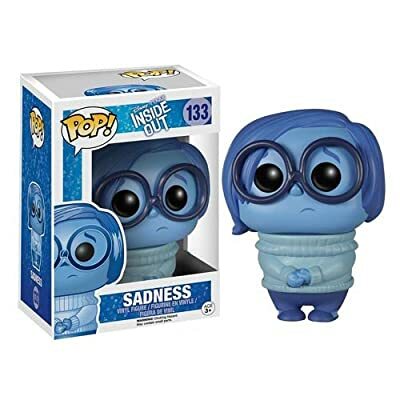 Sadness, voiced by Phyllis Smith is a tad smaller than the Joy doll (of course, keeping them all in the right scale with each other) but equally as delightful and beautifully crafted...yup again with that gorgeously cute memory ball, which gives you the option to put a picture of whatever you want inside. Adorable, right? If like me, you like buying animated movie character dolls as gifts, then you would do well to get Sadness for someone who likes the cute factor. 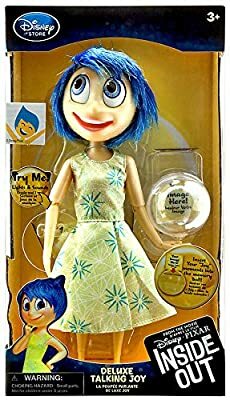 Kitted out pretty much in all blue, this Inside Out doll would also go well for anyone with an obsession with all things blue, yup, this gal doll is ideal for a color lover! Awww...you can't not watch any clip of the character Sadness, and not feel a twing of pity...and well, affection for her cuteness. 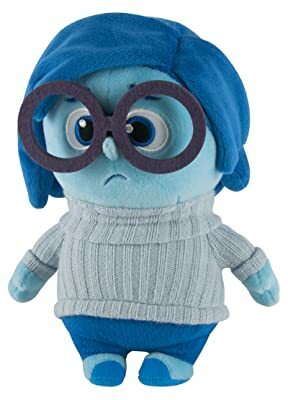 This Inside Out Sadness doll, is perfect when it comes to giving you something cute and adorable to look at, but with that edge of coolness, that you only get with the Pop Vinyl figures. Standing at number 133 in the collection, there's quite a few to find if you want to get each and every one of them...but hey, why not just start off with the figures from Inside Out first. I'm starting to think I'm getting a bit obsessed with Inside Out's Sadness, I mean, come on, isn't this the cutest doll? Standing at 9inches, this li'l cutie not only looks adorable and huggable, but this Sadness plush doll also talks. 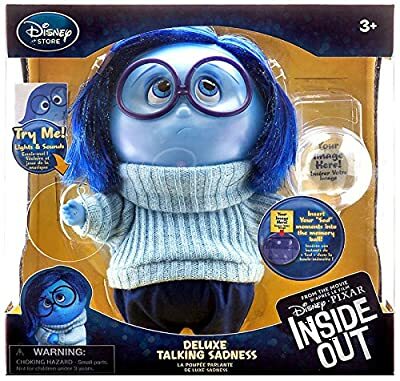 Yup, she'll recite for you five different phrases from the Inside Out movie, so you'll be able to relive the beauty of the movie, from whatever adventures you decide to take the blue sad lady on. There are quite a few different Inside Out plush dolls out there, so you'll have a hard time deciding which one to buy. This one is featured as part of the premium plush collection - and it's not difficult to see why. Have you seen the INside Out Trailer? If you're new to the Inside Out party, then don't wait any longer, watch the trailer now! The idea for Inside Out is so original, and extremely cute. Who knew our emotions could create such a fun and engaging animated movie. I think I've watched this trailer well over 50 times already! What isn't to love about the Inside Out doll, Anger? Beaming (literally, yup this little guy lights up too), bright red and with an angry little expression that looks like he's just stepped off the film itself. Similar to the Sad doll, Anger stands as the smallest of the Inside Out character doll range, but as we all know, good things come in small packages! 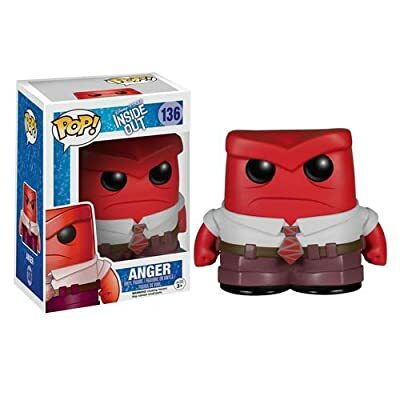 Anger comes with phrases from the movie, as well as the totally awesome memory ball waiting for YOUR favourite memory, or a picture of your favorite person! 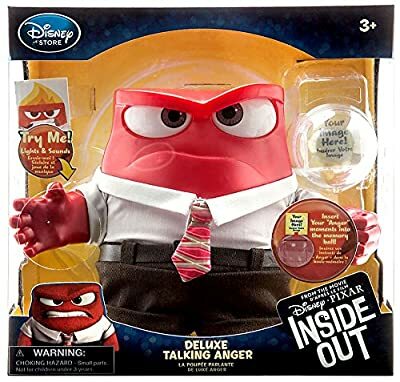 Even though Anger is a moody so and so, he would be a welcome addition to any Pixar fan's collection of memorabilia. If you love red, or know someone that does, this doll would be perfect for that colour scheme! Don't you just the character design of this awesome Funko version of Inside Out's Anger? It's so simple, yet totally says to you "hey, this is one angry dude! "...red, the colour of passion and fire, and I just know this guy is both of those things. 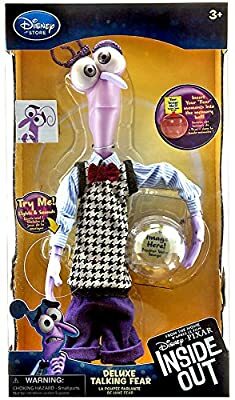 If you're looking to increase your collection of Pixar designer toys, then you would do well to get this fella on your shelf. 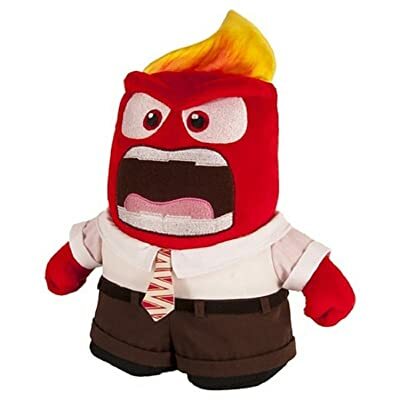 There are a couple of different versions of the Anger plush doll, but there are a few things I like about this one in particular. Firstly, he talks...what's not to love about that? 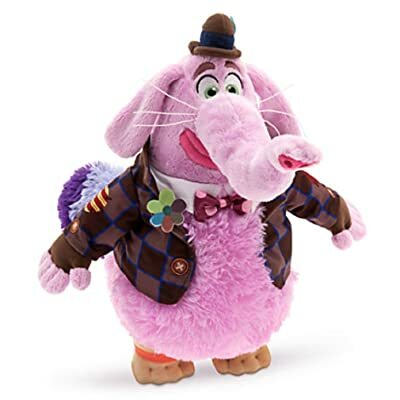 He comes complete with eight different phrases from the Inside Out movie (which compared to the other talking plush dolls, is a lot of phrases). And secondly, this plush version of Anger, features his cool like flaming hair do. You'll see other dolls that show Anger as the red flat top...but this plush shows him in action - sporting his flaming head of Angriness! Coming in just a tad taller than the Sadness plushie, Anger stands at 9.5inches. I don't know why, but I see this doll as a cool gift for anyone who works in an office. He looks like he's ready for work, and who on earth hasn't felt like Anger looks, when in the office?! One of the taller Inside Out characters, the level of detail that has gone into the production of this doll is utterly beautiful and creates a true likeness to the character from the movie. As with the other talking dolls, this one will talk and light up. 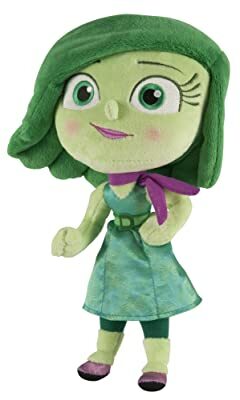 Who knew a green character, full of sass and quick bitter remarks could make such a wonderful doll? That the thing I love about Pixar, they always give us the unexpected. Disgust rocks! Wanna see for yourself how awesome the Inside Out Disgust doll is? Check out this fab review here, by youtuber Justin Jayubo. Not only will you see for yourself how the doll looks from all angles, but you will hear some of the 11 phrases Disgust uses from the movie. Plus, you will see exactly how those funky memory balls work. Disgust makes me laugh. She's so full of attitude and sass, she's actually really likeable...which is so unlike someone who's always disgusted, right? Ha! Anyway, I love this little green lady. Meet Disgust. 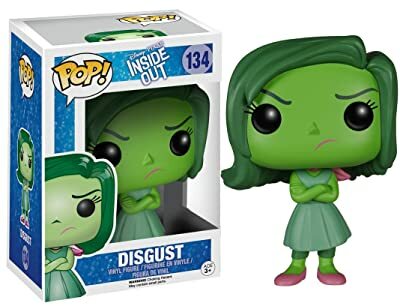 Voiced by the hugely talented Mindy Kaling, this funko vinyl toy is beautifully made, and inhabits all those qualities you see in the Pixar movie with this one simple pose. The beauty of Inside Out, is if you can't decide which doll to buy, you can narrow it down to choosing you favorite color. If you love green, then this toy is a no-brainer, get this one! A really fabulous designer toy to add to your Inside Out or Pixar collection. Amongst the taller version of the Inside Out plush dolls that also talk (! ), this Disgust doll will take up all 11inches of height, when she's on your shelf...that's a lot of hugging space for your arms and bed! Hooray, we have another talking plush doll - I really love this feature in a doll. Disgust will talk to you one of seven different phrases from the Inside Out movie, including the sassy line "She did not just say that". I love the colours of Disgust - purpley/pink compliments the green so well...and her 1950s neck scarf makes her look like a junior Rizzo, from Grease, don't you think? Funny thoughts like that, just make me love Disgust even more! A funny and cute little character that makes anxiety and worry seem alarmingly cute. If you loved Fear, this little guy would make a solid item to add to your shopping basket. This Fear doll stands at around 26cm tall and comes ready and willing to speak phrases from the Inside Out movie itself. Still want more from your Inside Doll, well this guy will also light up when he talks and comes bearing a memory ball ready for you to add a an image of your best memory. Isn't that such a gorgeous idea? 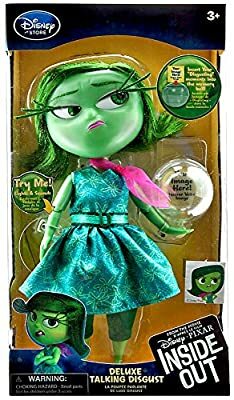 If you're looking for a gift, this Inside Out dolls is totally perfect for anyone who adores exquisite animated characters, or for someone with a mild obsession with the color purple, and also perhaps for someone who has a neurotic alter ego (kidding). Whoever this doll is for, your child, niece/nephew, partner, teacher, toy collector...they would be very pleased you got it for them! I'm sure everyone can relate to this little purple guy. Yup, everyone's most neurotic and panicked character, Fear. Inside Out designers really had their work cut out when they were creating the look and feel for the cast of characters. Each one is so well designed and completely different from the next, with bold colours and clearly defined shaping. But they work so well as Funkos too. My sister loves Pixar, and she also happens to love the colour purple. So, can you guess which Inside Out funko doll she'll be getting for her birthday this year? Look at this little guy, isn't he adorable? I know a lot of people who are obsessed with a very particular color. Purple. It's just one of those things, people who love it, really LOVE IT. When I fist cottoned on to the fact that Disney Pixar's Inside Out movie, was using block colors to differentiate between all their keys characters, I was really interested to see if they would have a purple one, and yup, yup, yup, of course they do! Here we have Fear! He's 12.5inches tall, and like the others; give his little hand a squeeze and he'll talk one of his six phrases from the movie! What more do you want your favorite animated movie character? Have you ever wondered how amazing it would be to snuggle up with a big ball of cotton candy? Maybe you have, I dunno, but with this fabulous Inside Out, Bing Bong Plush doll...you can! Yes, Riley's wonderful imaginary friend literally is scented with the beautiful aroma of cotton candy. Does animated movie dolls get any better than that? The detailing in this beautiful Inside Out doll is exquisite. Bing Bong's hat and jacket are perfectly crafted with embroided detail, as well as the different materials used to make up his satin bowtie and the felt flower on his lapel. His fluffy tummy is where the magical sweet scent is, and you'll be wanting to hug him and hug him to send you off to the sweetest of dreams. The bottom of his foot also carries the official Disney merchandise badge, so you know you're getting top quality. 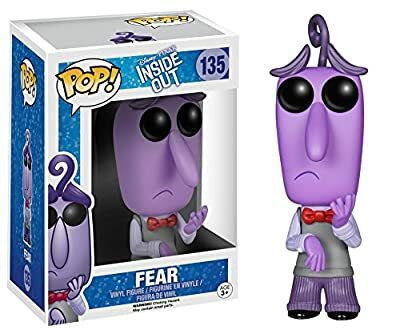 Inside Out Bing Bong Funko! Finally! THE BING BONG FUNKOS ARE HERE!! Anyone who knows me, knows how obsessed I am with Funkos. I adore them. I love their design, I love their quirky look...I just think they're fab. And here with have everyone's favourite imaginary friend, yup, it's Riley's Bing Bong. 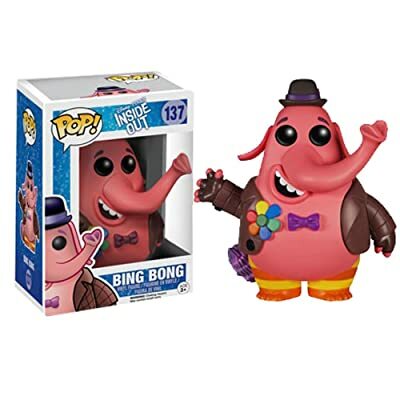 Coming with all the recognisable features of Bing Bong himself, the hat, the gloves, the jacket, the bow tie and that all important flower on his lapel...this funko is set to rival every other funko in your Inside Out collection. So what are you waiting for? Get Funko number 137 into your collection today! Bookmark this page and keep checking back, more and more Inside Out dolls will be added to this page, so be sure to visit again.